At its peak, Superstorm Sandy brought sustained winds of up to 80 mph, at least 24 major fires and flooding that garnered a FEMA “unwatering” team to drain downtown New York City, according to Nytimes.com. The rest of the country watched, prayed and donated as residents of New York and other East-coast states took a beating. As Hurricane Sandy passed, Americans resumed living their lives and the East coast put itself back together. The ball dropped in New York City just like it does every year, and many forgot the storm happened altogether. Small businesses up and down the Northeast coast have been unable to forget Sandy, however. While aid came to help those in danger, businesses and entrepreneurs have slowly worked to restore New York and surrounding cities as a Mecca of opportunity. 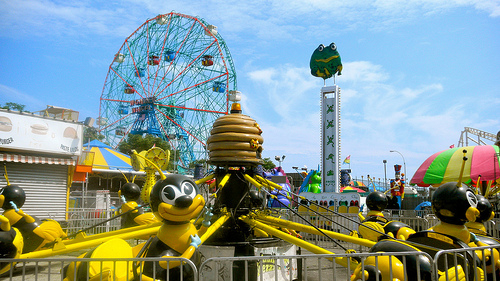 Entrepreneurs are hoping summer brings more tourists to places like Coney Island. “We’re almost dead, but we’re open,” amusement park owner D.J. Vourderis told Huffingtonpost.com. Entrepreneurs across the East coast are echoing this sentiment. The recovery has interrupted existing small businesses and stalled start-ups hoping to win big, but summer promises to bring an important economic recovery boost. Start-ups like ZeroCater, which makes it easier for businesses to provide lunch for its employees, have experienced the uptick in the economic. ZeroCater recently launched a New York wing (it was previously only in San Francisco), noted Techcrunch.com. An influx of tourism means opportunity for entrepreneurs and cash flow stability for existing small businesses. The East coast could use both right now. Small businesses haven’t been completely alone in their efforts to rebuild. The U.S. Small Business Administration recently announced that it has approved more than $2 billion in disaster loans to 32,500 residents and businesses. The vast majority of the money ($1.8 billion) went to residents with home repair, but businesses in NY, NJ, CT, RI, MD, WV and NC have received $260 million to rebuild their ventures and resume serving their communities. The SBA deadline to apply for physical property damage relief passed on April 13, another sign that officials believe economic recovery from the storm is almost complete. Under normal circumstances, New York City and surrounding areas are hot-beds for entrepreneurs. Despite a high cost of living, metro New York boasts a strong ratio of 27.73 small businesses per 1,000 residents, according to Thefiscaltimes.com. A larger population increases the chances that your small businesses will succeed. The more potential customers, the better chance your start-up has to thrive. The East coast’s temporary economic struggle following Sandy shouldn’t deter entrepreneurs from jumping off the diving board. No one is rooting against start-ups (other than competitors), and many businesses and organizations are actively supporting new ventures. One example is Connecticut Innovations, which recently donated $950,000 to six local startups. Pursue your start-up idea this summer and you’ll find a consumer population re-energized by sunshine and good times, whether you’re on the boardwalk at Coney Island or a cubicle in Connecticut.